Welcoming you at Tirana International Airport and heading straight to the capital Tirana. Accommodation and a short break before we start the city tour. First we visit the National Museum of History. Walking the central avenue and the central square, we next visit the Ethem Bay Mosque and the Clock-Tower and the remains of the Castle of Tirana. We also go deep underground to visit the Enver Hoxa bunker, a former communistic leader of Albania. We walk on to the Pyramid - mausoleum of the late Enver Hoxha, designed from his daughter. We will end the tour at Enver Hoxha house in Blloku. This evening we have a welcoming dinner and overnight in Tirana. After the breakfast in the hotel, we leave for the ancient town and port of Durres, a UNESCO site. We walk along the Adriatic Sea and visit the remains of the ancient amphitheatre that once hold 20.000 people making it the largest in the Balkans. Possibility to visit the City museum of Durres. In the noon we can advise lunch at a sea side restaurant for outdoor delicious seafood dishes, other dishes possible. In the afternoon, we drive to the medieval capital of Albania, Kruja. High in the mountain cliffs, we will visit the castle of the national hero of Albania, Skender-beg. Exploring the narrow streets, we will walk through the unique Ethno bazaar. After a short break, we drive back to Tirana. Free evening and overnight in Tirana. After the breakfast at the hotel, we drive to Berat, one of the most visited and characteristic towns in Albania, the last UNESCO site in our trip. After visiting the fortress of Berat, we will stroll down to the center through the narrow streets of the old part of the town. A great opportunity to meet locals, to mingle with them and talk about the life in Albania. In the central street of Berat, where the most of the restaurants and cafes are situated, we will have free time for lunch or coffee on your own. Than we drive back to Tirana. Tonight we have free evening to wonder around the Albanian capital. Overnight in Tirana. After the breakfast at the hotel, we drive to the neighbouring Macedonia, heading to the city of UNESCO – Ohrid. After the accommodation, we start a tour through the old city of Ohrid, one of the oldest towns in Europe, full of history with traces of four thousand years of civilization. We will visit famous medieval churches – the Holly Mother of God Perivleptos and the church St. Clement of Ohrid at Plaosnik, the fortress of Tsar Samuel with a beautiful panorama, the ancient Macedonian-Roman theatre, sailing with small boats on the way back to the centre. Explanation of the history, the biggest open air museum of the Byzantheum. Next we will visit the medieval church of St. Sophia and further on we will stop at a pearl shop store, where the workers will give us a short explanation on the famous Ohrid pearl making process. Free time to explore more of this UNESCO site. Free evening. Breakfast at the hotel. Today we will explore the lake and the coastal area of the Lake Ohrid and a part of the National Park Galichitsa. We will start a boat trip to the unique reconstruction of a prehistoric settlement on water from the Bronze Age, called Museum on water or Bay of bones. Presentation by the professional curator. We continue sailing to the extraordinary monument of nature - the lake springs and the monastery of St. Naum from the 9th century. Lunch in the restaurant near the lake springs. Free time. Sailing back to the town. Organized dinner in a national restaurant with a folk ensemble and traditional Macedonian songs and dances. Overnight in a hotel. Breakfast at the hotel. Today we drive to the Macedonian capital, Skopje. On the way, we stop in the town Tetovo to visit a 15th century built mosque, painted in unique way in the 19th century. From Tetovo, we take you to one of the most beautiful canyons in Europe, Matka, with the river Treska. We will have a lunch break in the restaurant on the bank of the river, possibly a river trout, and by small boats we will set sail 6 km upstream to visit the cave Vrelo, full of cave decorations, like stalactites and stalagmites. Free time in the canyon for individual activities. Drive to Skopje, accommodation and free evening. Overnight in Skopje. In the morning we start a walking tour from the centuries old Kale – Skopje fortress. We will continue to the Old Turkish Bazaar, mingling with the locals, meeting different cultures and religions, old forgotten crafts, as well. After that we go to the Archaeological museum of Macedonia with one of the biggest ancient coins collection in the world exclusively from the Macedonian territory. We walk across the Stone Bridge, the land mark of the city, and stop in front of the biggest monument and fountain of Alexander the Great. The next stop will be the memorial house of Mother Teresa. She was born in Skopje in 1910. In the afternoon we drive to the mountain Vodno where we visit the Millennium cross. To visit this landmark of Skopje, we take cable car up to the top of the hill, a great place to admire the panoramic view to the city and plane of Skopje. Back to Skopje, free evening. Today we enter the youngest European country – Kosovo and its capital Prishtina. Close to the capital, we will make the first stop to visit a UNESCO protected medieval monastery in Gracanica, completed in 1321 by the Serbian King Milutin. The monastery is rich with medieval era fresco paintings. Than we drive to Prishtina. Accommodation in a hotel and start exploring the city visiting the Emin Gjiku Ethnographic Museum, set in Ottoman houses, with a range of Ottoman weapons, clothing and jewel and household items exhibited. In the city centre we will see a 26 meter high clock tower. We will stop at the National Library to see the unique architecture of this building. In the Independent House of Kosovo we will find out the story of the former president Ibrahim Rugova and Kosovo’s campaign for independence. Sultan Mehmet Fatih Mosque and Jashar Pasha Mosque are the next on the list, the most important Ottoman mosques and local attractions. Free evening. 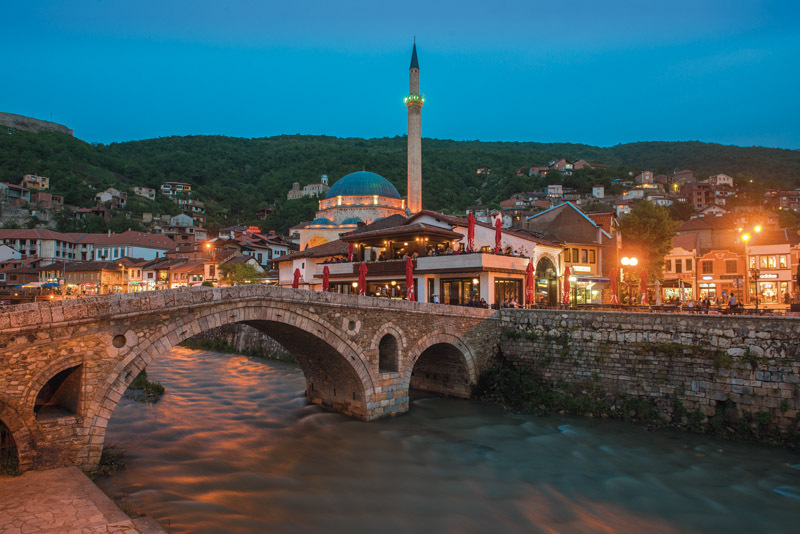 In the morning, on the way to Montenegro, we stop in another town – Prizren, known for its gold and silver filigree craftsmen, hammams, Museum of Prizren League, Helveti Tekke, Sinia Pasha Mosque and the church of Our Lady of Ljevis. Prizren has the largest number of preserved Ottoman buildings in Kosovo, with the old cobbled streets, mosques and tekkes. We leave Kosovo and head to the capital of Montenegro, Podgorica. After the lunch break on your own in a restaurant in the city center, we take you around the town and show you some of the most important historical monuments and buildings in the city - the Skaline (the stairs) which is a historic and picturesque site of Podgorica, the Republic Square, the St. George church form the 11th of century, Millennium Bridge, Clock Tower (Sahat Kula) from 17th century. From Podgorica, we drive to the coastal town of Budva. Accommodation in a hotel and free time for a dinner. We start the day with Budva sightseeing from the old town in the fortress - narrow streets, squares and stone. We will go to a high clock tower - the bell tower of St. John's Church, the most famous Catholic monument in Budva. Next stop is a Citadel Fortress, built 2500 years ago, with preserved watchtowers, ramparts, stairs and barracks, built by the Austrians in 1836. Within the walls of the Citadel there is also a valuable collection of books and maps dedicated to the Balkans. A small Maritime Museum is also here, which presents a model of medieval ships. In the afternoon, we head to Kotor, UNESCO World Heritage city, with a long history dating from 1000 years B.C. We will take you around the Old Town and show you Square of Arms, Byzanti Palace, Beskuca Palace, Pima Palace, St. Tryphon Cathedral, Maritime Museum, St Nicholas Church, Blessed Ozana Church as well as the North gate. Next point is one of the most iconic places on the bay - Perast. We will admire the gorgeous Baroque and Venetian architecture and perhaps take an optional boat trip to the small island Our Lady of the Rocks. Free time for lunch on your own. Back in Budva, organized dinner. 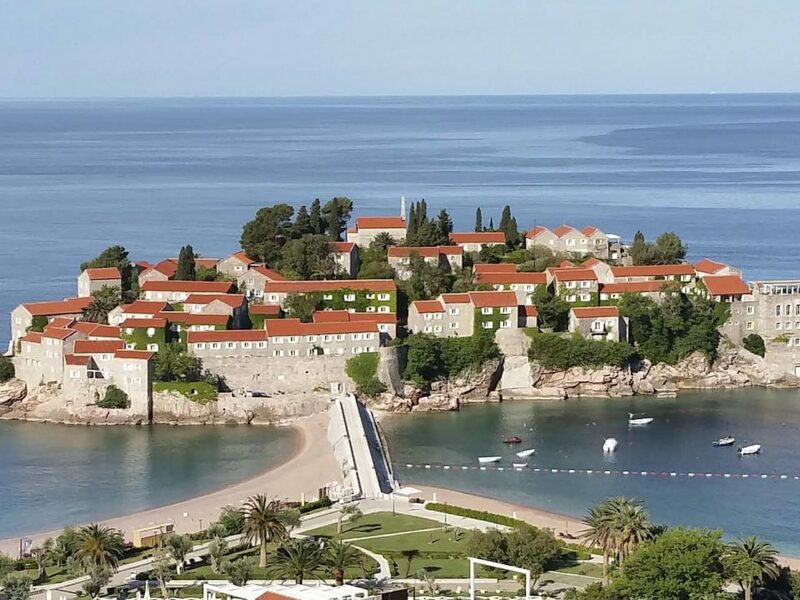 Morning departure and photo stop at the famous and the most luxury resort in Montenegro, Sveti Stefan, built in 15th century on a rocky island and originally refuge for those fleeing the invasions of the Turks. Free time for a drink along the coast cafes. 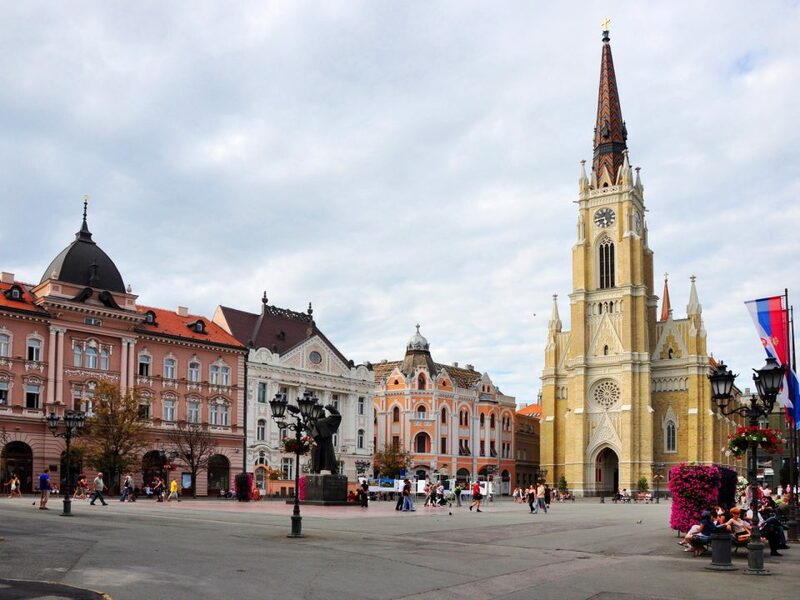 Then we depart to Cetinje, the historical and cultural capital of Montenegro. 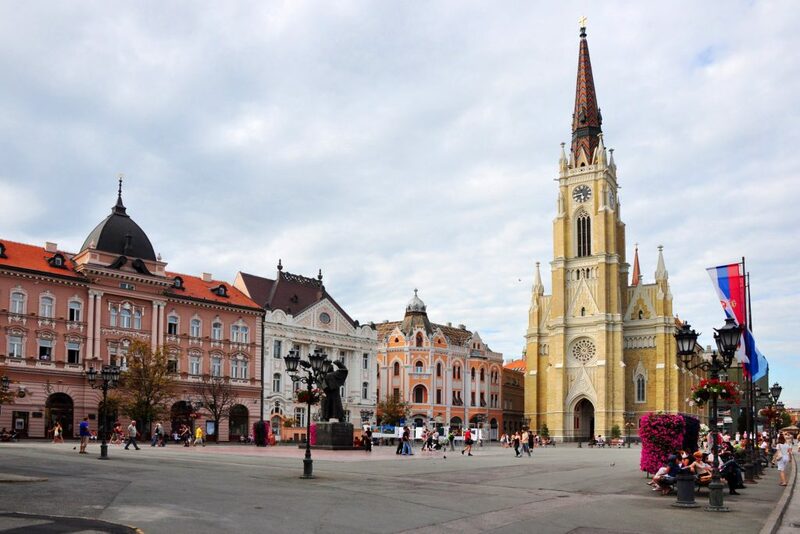 We visit Prince Nikola's Palace and Vlaska Church, dating from the 15th century. We will have time to wonder around the streets of Cetinje and admire the architecture of this once capital, even see still standing buildings of once embassies in this small town. Coffee break and depart to Podgorica. The rest of the day at leisure, and time for shopping in the capital. Overnight in Podgorica. Breakfast and transfer to the airport in Podgorica.